Bisexual Passions: Review – Don’t Just Hook Up, Make Friends! While a vast majority of online dating sites in general are just about dating, getting into a relationship and hooking up, the website “bisexual passion” is a rare breed as not only does it help its members find relationships but also good friendships. It is a relatively popular website that caters specifically to people from the bisexual community as well as people who are curious about bisexual relationships. The website, as the name suggests, is part of the passion network which currently hosts more than 250 sites under its name. 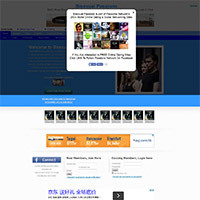 The website is free to join but to upgrade their accounts, members have to pay $4.95 per month. Payments to the website can be made through credit or debit cards, PayPal, a bank check or money order by postal mail, which is satisfyingly convenient. It is rare to see a dating website offering so many payment options. A standard user has access to a limited set of features and the search engine they use is quite basic. By upgrading, a member gets advertisement free access to all the existing sites of the passion network. Upgraded members can post a free profile and upload up to 10 photos. There are a number of good conversation starters, such as the ability to send “smooches” and “hugs” and then there are options such as “bites,” ’licks” and “punches” we are unsure were actually meant to convey to the other you are interested in getting a conversation started or make others think you have had too many bottles of vodka while surfing the dating site. You are free to use, provided you have a chat photo, bisexual chat rooms and also the “podcast buddies” and “newsletter buddies” program in order to expand your reach on the network. The website also allows its members to upload videos and even submit video games. Copyrights be damned, video games on a dating site? Isn’t it exciting? The interface is not for show, it is practical and navigation is easy. As it is part of a wide network, you get access to a large and diverse set of members. Privacy is not a strong aspect of this online dating website. For free members, there are not many privacy options which can be a bit of a problem. Upgraded members have the option to remove their profiles from the public search engine. The website maintains personal information such as name, email address, home address, and phone number will be kept confidential. However, a user’s basic information will be available to public search engines. The registration is not so vexing. It requires some details and your account is set up in minutes. Moreover, the interface is easy to navigate and get used to. If you are interested in or curious about bisexual relationships or want to make friends with people of the same orientation and do not mind the lack of privacy, this site can turn out to be a somewhat good experience. For less than $5 a month, this site really does provide good value for money even if the features are not at par with other famous online dating websites. You get what you pay for. Do not expect it to be much out of the ordinary.